Happy Friday, guys! It's my last Friday before school starts. Insert sad face. 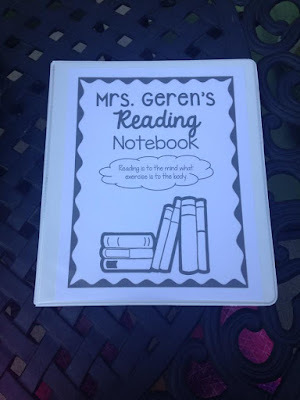 We are going to enjoy our last day by going swimming all afternoon so I wanted to pop in this morning and share my plan on having Reading notebooks in my classroom this year. 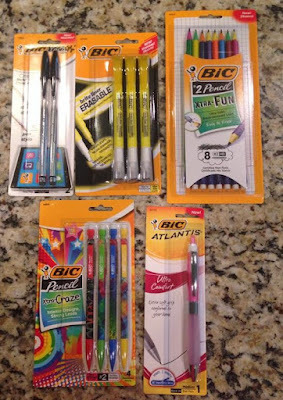 I've been pondering all summer how I will set up my reading notebooks this year with the school supplies the students will have. 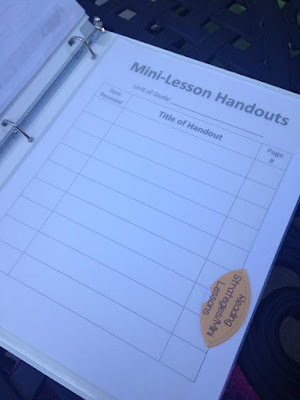 I've researched by reading many blogs, read this post on the Scholastic website by Beth Newingham, and thought about the ways I've used Reading notebooks in the past. 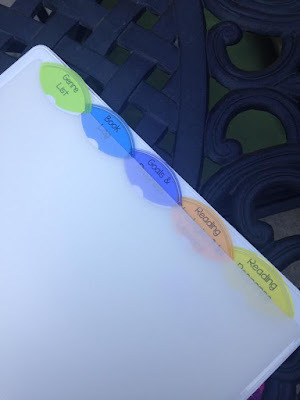 I don't claim to have any answers on what is the best method of organizing a readers notebook, but this is what I am going to try this year. I'll evaluate how it works and make changes if needed. We are going to use a 1/2 inch binder (hopefully that can change to a 1 inch binder next year) for our Reading notebook. 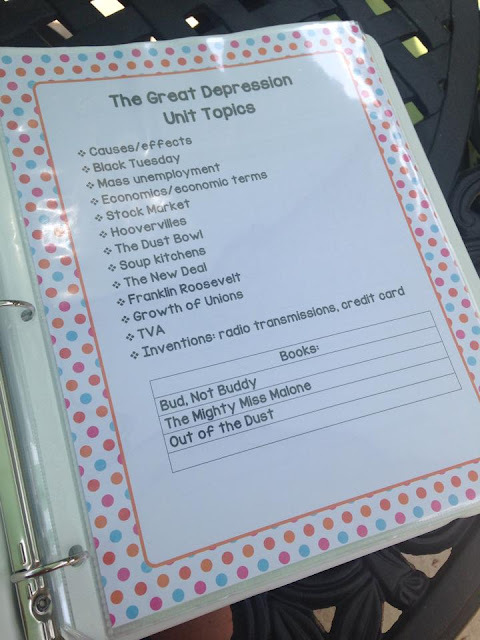 Students will create a cover page on one of the first few days of class. I created one on PowerPoint. I have organized mine with tab dividers into 5 sections. Those are: genre list, book log, goals and progress, reading strategies/mini lessons, and reading response. Now, let's look at each section. My school uses Donalyn Miller's idea of having a 40 book challenge for 5th graders. 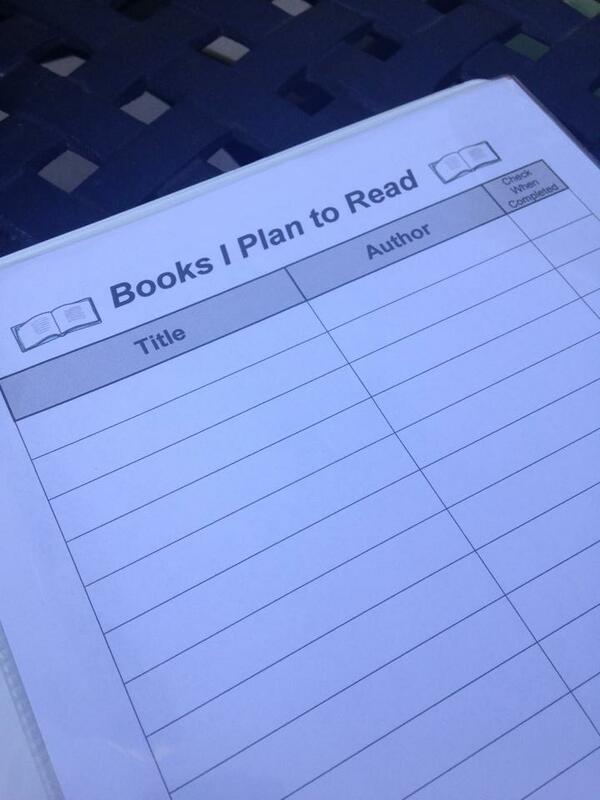 I will not require my students to complete a reading log nightly. Instead students will keep a log of the books they have read using a book log. I also have a "Books I Plan to Read" page in this section. Hopefully as we do book talks, students will find books they want to read and I'll encourage the use of this page. 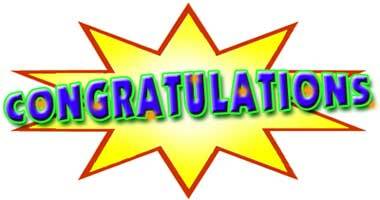 This was also found on Beth Newingham's post on the Scholastic webpage above. Because we will be using a 1/2 inch binder and I feel like space may be an issue, this section will probably not be utilized this year in this binder. Instead, we will use a pronged folder for our reading responses. So, students will have a reading response notebook. 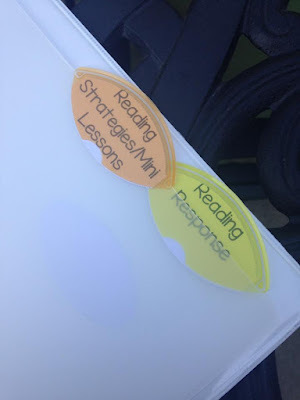 I have created this suggestion list using a variety of sources (Beth Newingham's suggestions and Rachel Lynette's reading response on TPT). 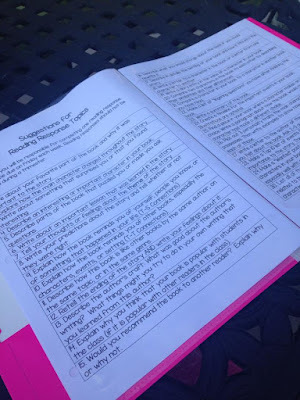 Students will write me a reading response once a week based on the book they are reading. 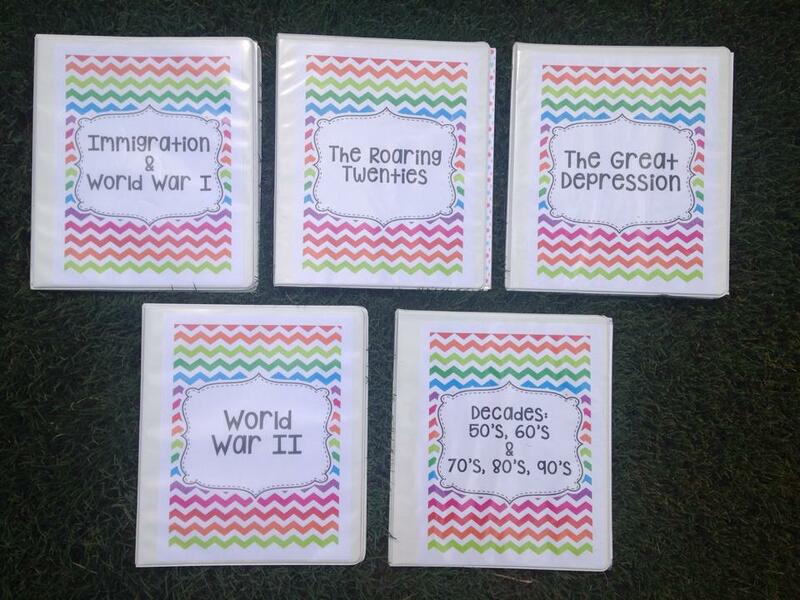 *If I feel like we can fit it into our binder, that would be ideal. If not, it can be it's own folder for now. to Jen for winning the set of BIC supplies! Your goodies are on the way! 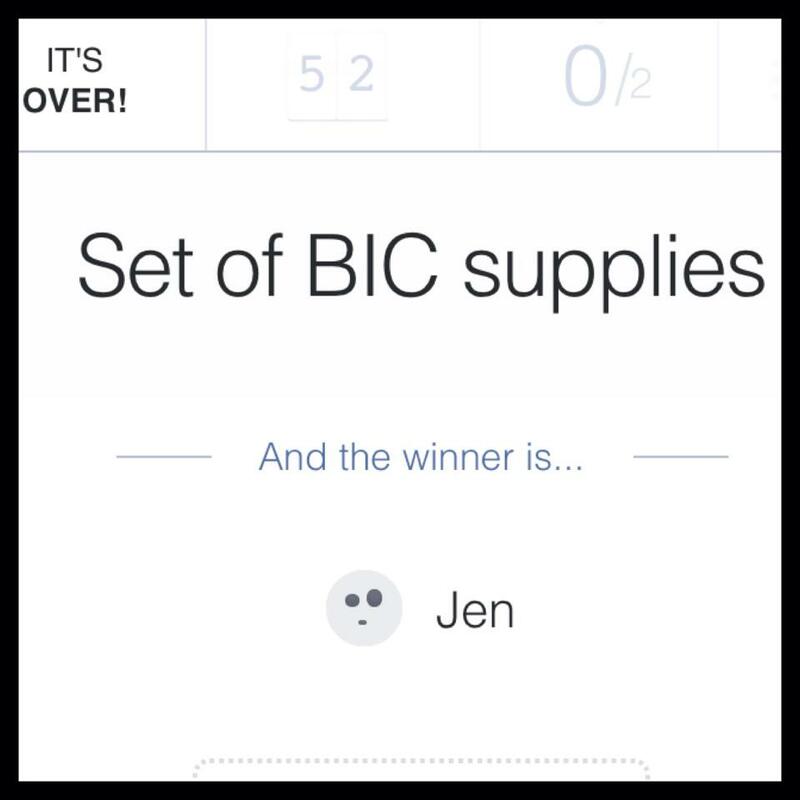 Thank you to all who entered! 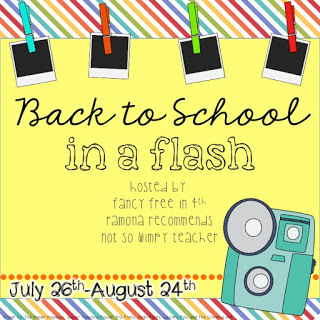 Back to School in a Flash! 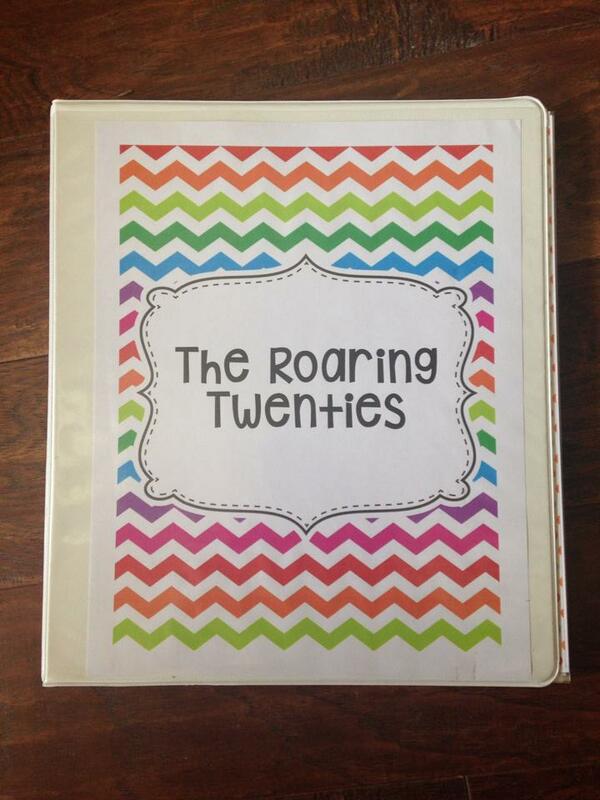 It's no secret that I love being organized and that I LOVE planners! This year I am using this cute Day Designer planner that I purchased at Target. I am loving it so far! I purchased this super cute personalized pencil pouch on Jane last year. 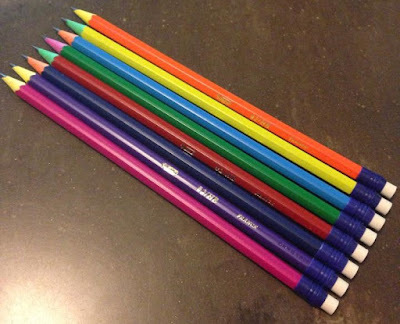 I love the design and it's perfect for holding all of my teacher supplies (pens, post it's, etc). The GOOD news is they just happen to have them on sale tomorrow (Monday, July 27th) on Jane. Inside my pencil pouch you'll find lots of Flair pens! Hands down, they are my favorite pen. We all know that the first few weeks back to school can be especially tiring. 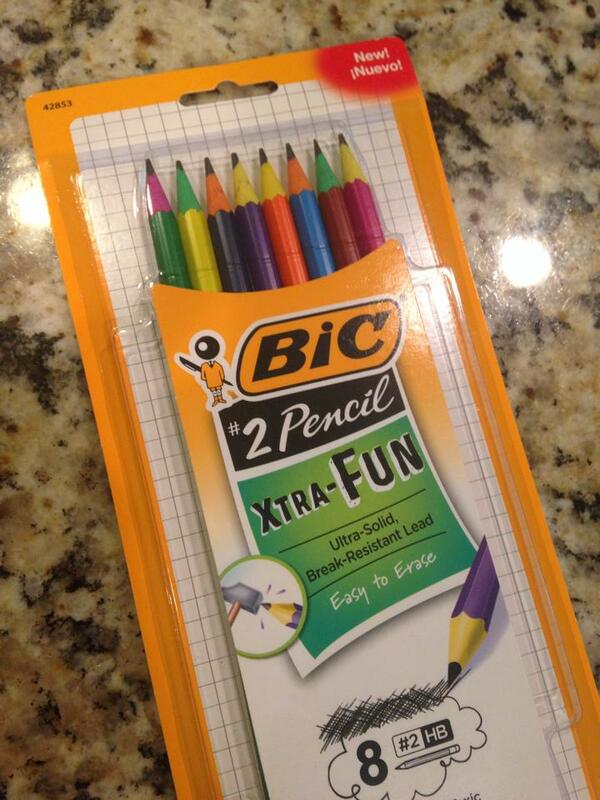 I LOVE Spark and drink it daily, but I'll definitely be depending on it during the first few weeks of school. It is my lifesaver! 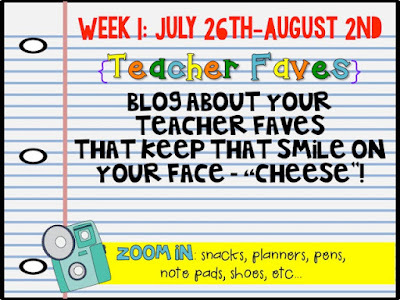 What are your teacher faves?! 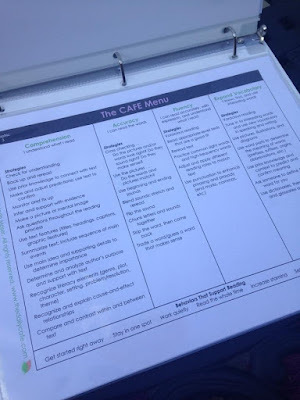 I've been wanting to share a few things that stood out to me while we were there. 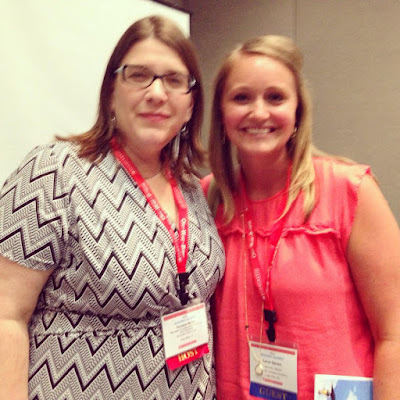 I was SO excited to attend two sessions with Donalyn Miller, author of "The Book Whisperer" and "Reading in the Wild". I read "The Book Whisperer" a few years ago and just finished rereading it before the conference. 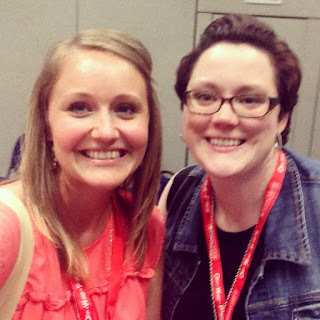 Here are some things I learned from the conference and from Donalyn! 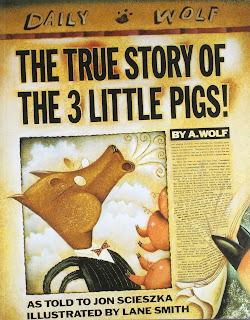 BOOK TALKS - We all know the importance of sharing good books with our students. 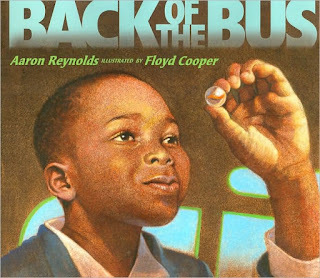 We need to make sure that our students are being exposed to good literature. 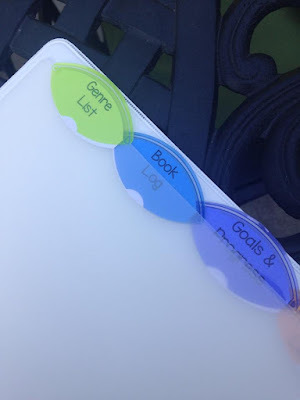 It is my goal that by incorporating book talks into my classroom, I will have students who want to read books after listening to their peers and/or myself talk about a book. 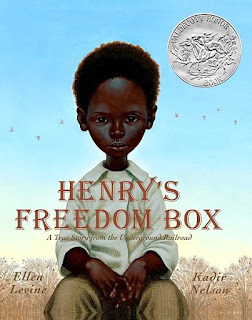 My plan on incorporating this into my Reading class is to have Book Talk Tuesday and Book Talk Thursday. My goal is to open the beginning of Reading class off with a book talk, providing I have student interest. 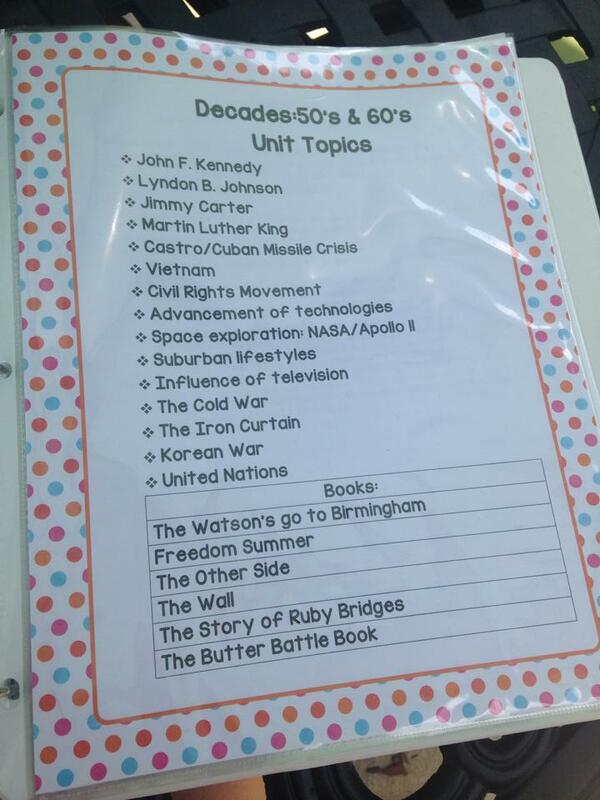 During one of Donalyn's workshops, we focused on the importance of allowing students CHOICE in the books they read. 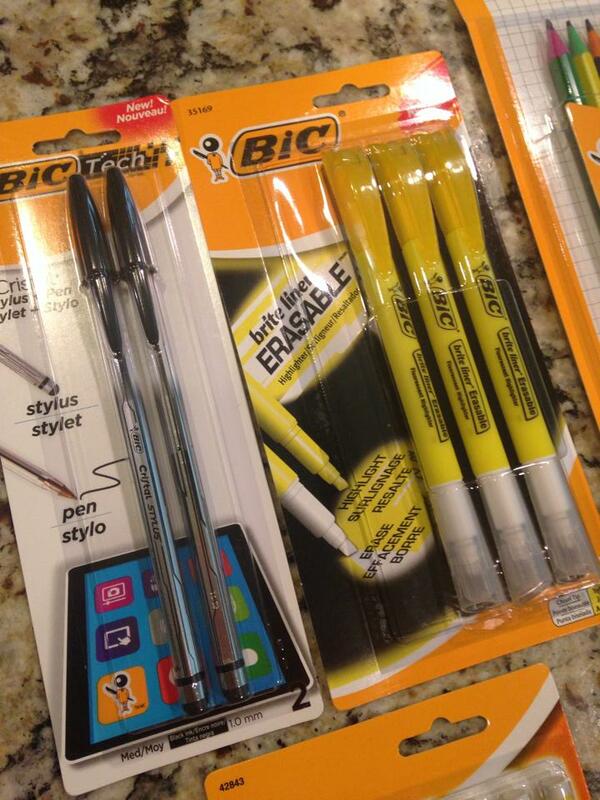 I am a firm believer that students should have choice. Although I have loved novel studies, I am going a different direction this year in regards to Reading and one I know will make a difference. 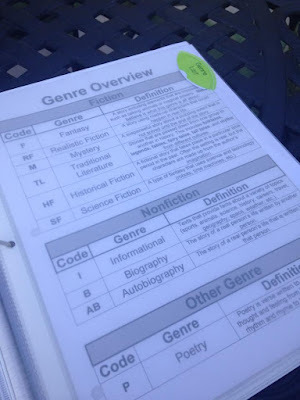 While students are given time to read, it is important to confer with students. I was able to connect with Donalyn so much because she was so down to earth and so real. It is hard to confer with students individually enough to meet their needs. Her advice was to start at the top of your list and work your way down. When you finish, start all over again. 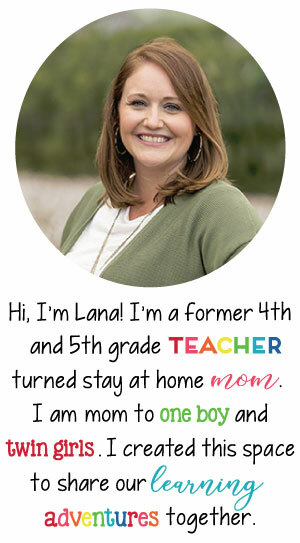 In her classroom, she will announce to the class what the topic of individual conferences will be ahead of time. For example, if they've worked on characterization, she would announce that prior to conferencing so students are prepared on what is expected during a conference. Something new I am starting this year is a reading response notebooks. 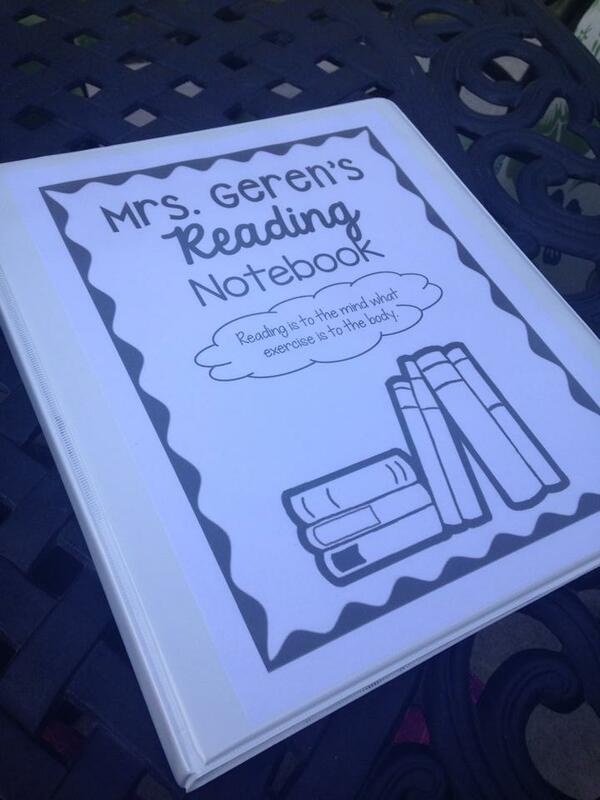 Students will be writing me a letter once a week telling me about the book they are reading. 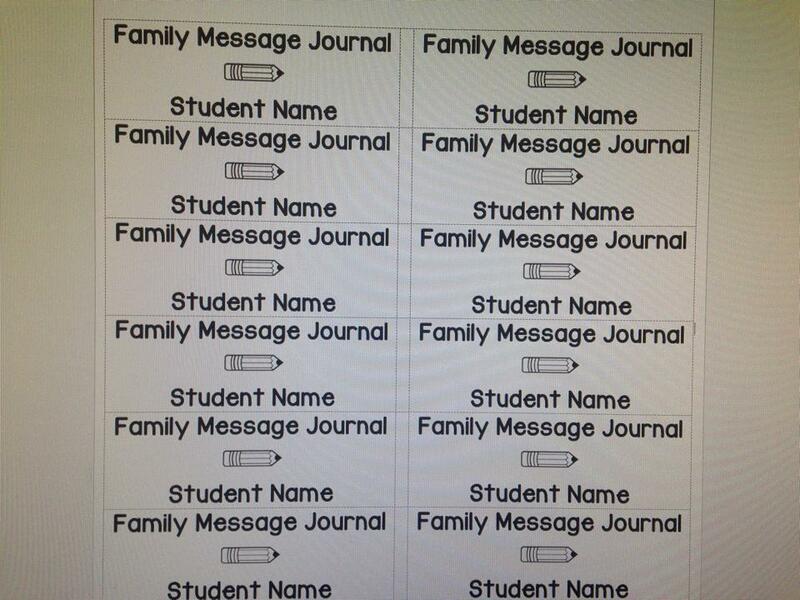 They will bring these notebooks to conferences. I am still pondering the best way for me to respond to them, but I like the idea of them being accountable for telling me about what they are reading. 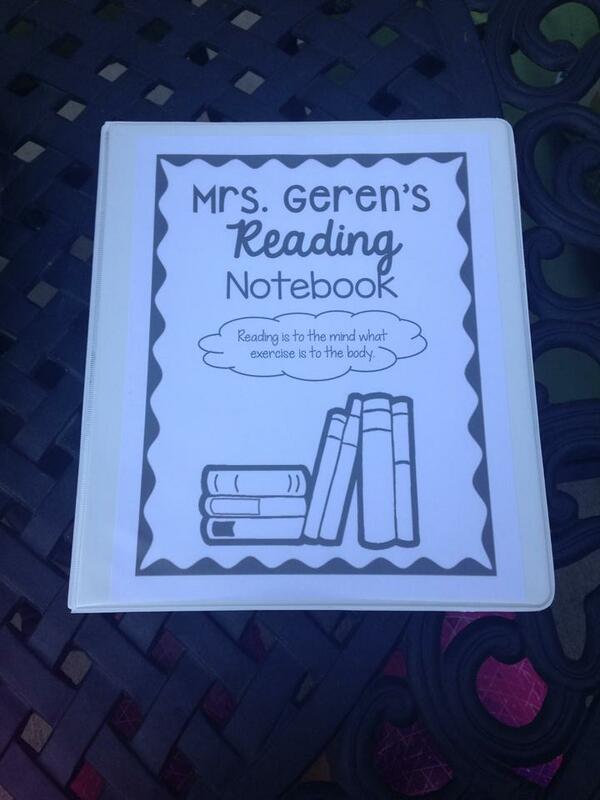 Although some teachers love and require reading logs, I am not requiring my students complete one. I was so excited to get my picture made with Donalyn after a workshop! Another idea shared was SHELFIES! I don't have a selfie of me with this stack of books, but basically you just take a picture of the student with a book or books they recommend. These can be posted in the classroom. LOVE this idea! 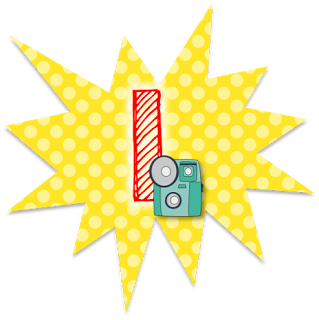 Donalyn said something during a workshop that reminded me so much of the blogging community. I am so thankful to read so many teacher blogs/Instagram's and gain so much inspiration and ideas from you all! While I was there I got to meet Jessica from For the Love of Fifth! I follow Jessica's blog and Instagram so it was neat to see her in real life! A few weeks ago I was contacted by a representative of BIC to review some of their products. 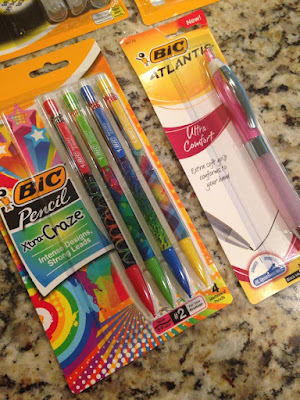 I LOVE back to school products so of course I agreed! YOU can win all of the items below in my giveaway! 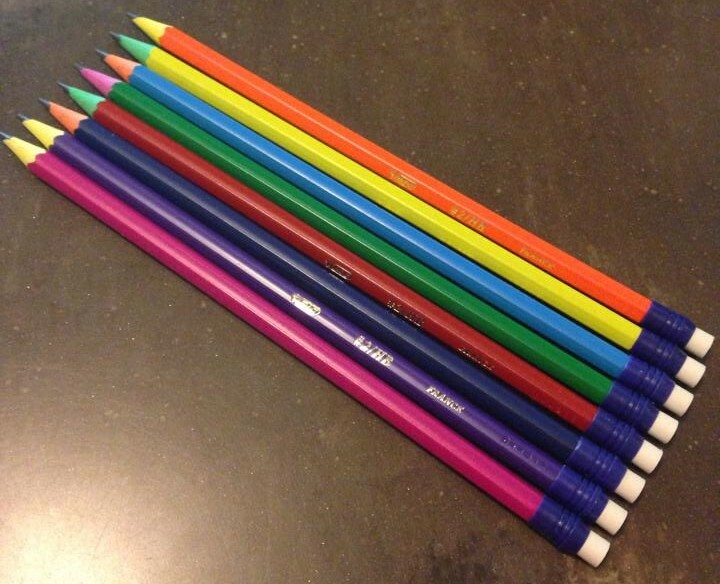 I can imagine that all students would love these bright colored pencils. Since I'll have a Kindergartener this year, we will have some school supplies stay at home for homework or projects. I'll let him pick a few of these out. The pen is probably my favorite because it is my favorite color AND it is actually very comfortable. It almost has a gel feel to it when you hold it. 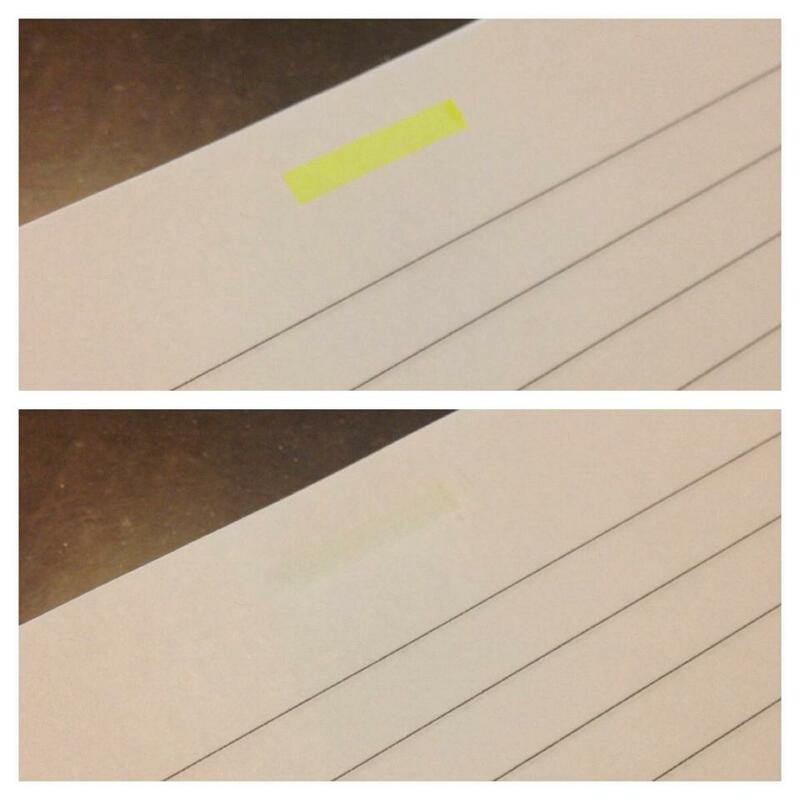 I thought I'd show you my results with the erasable highlighters. I wasn't sure how it would actually work, but it did! It does leave a little bit of a smudge, but overall it works really well. You can see the before/after picture below. Now it's your turn to win some BIG products! Enter my giveaway below! Today, let's talk about point of view. Point of view is the perspective in which the story is written. “In this humorous story, Alexander T. Wolf tells his own outlandish version of what really happens during his encounter with the three pigs…. 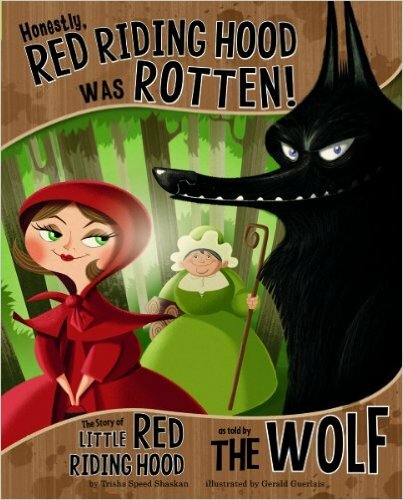 Smith's simplistic and wacky illustrations add to the effectiveness of this fractured fairy tale.” - Summary from Amazon. 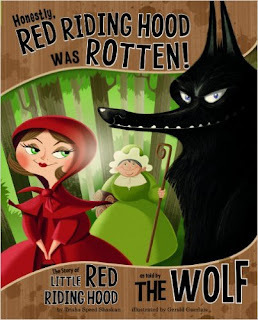 OF COURSE you think I did a horrible thing by eating Little Red Riding Hood and her granny. You don't know the other side of the story. Well, let me tell you... Text preview from Amazon. 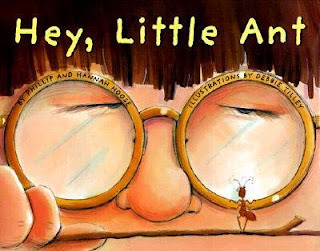 What would you do if the ant you were about to step on looked up and started talking? Would you stop and listen? What if your friends saw you hesitate? That’s what happens in this funny, thought-provoking book. Originally a song by a father-daughter team, this conversation between two creatures, large and small, is bound to inspire important discussions. It might even answer that classic childhood question: To squish or not to squish? Summary from Amazon. 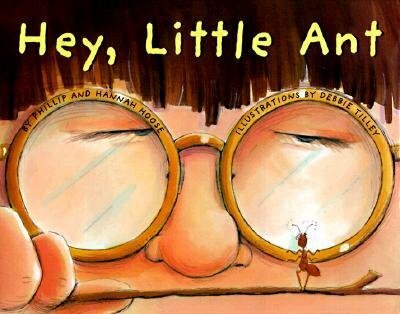 *I LOVED this book! So, so cute! Henry Brown doesn't know how old he is. Nobody keeps records of slaves' birthdays. All the time he dreams about freedom, but that dream seems farther away than ever when he is torn from his family and put to work in a warehouse. Henry grows up and marries, but he is again devastated when his family is sold at the slave market. Then one day, as he lifts a crate at the warehouse, he knows exactly what he must do: He will mail himself to the North. After an arduous journey in the crate, Henry finally has a birthday -- his first day of freedom. Summary of Amazon. * I love this book, too. It can easily be used in Social Studies. 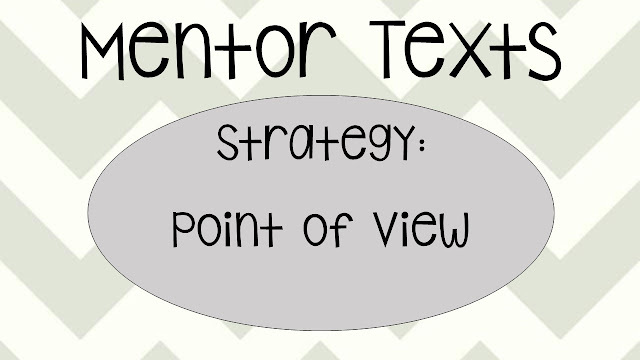 * This book is new to me, but I'll definitely use it this year for this strategy, as well as during a unit during this time period in History. What books would you recommend to teach point of view? 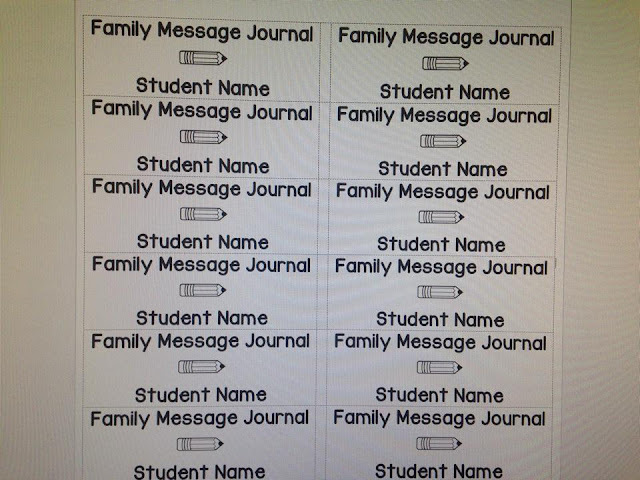 I am excited to incorporate Family Message Journals into my Writing curriculum this year. I have blogged about them before. You can read about them HERE. 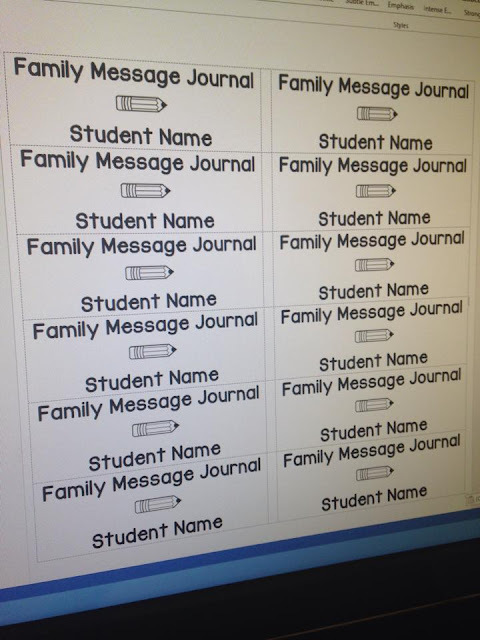 I created labels this week for the outside of each students FMJ. 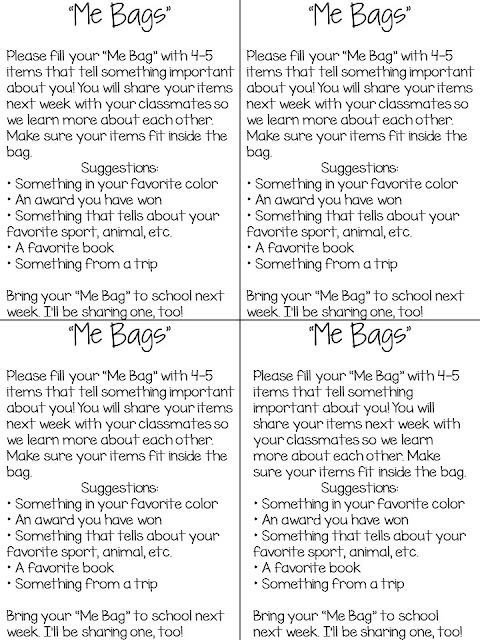 I also created "Me Bag" labels to attach to a lunch bag. 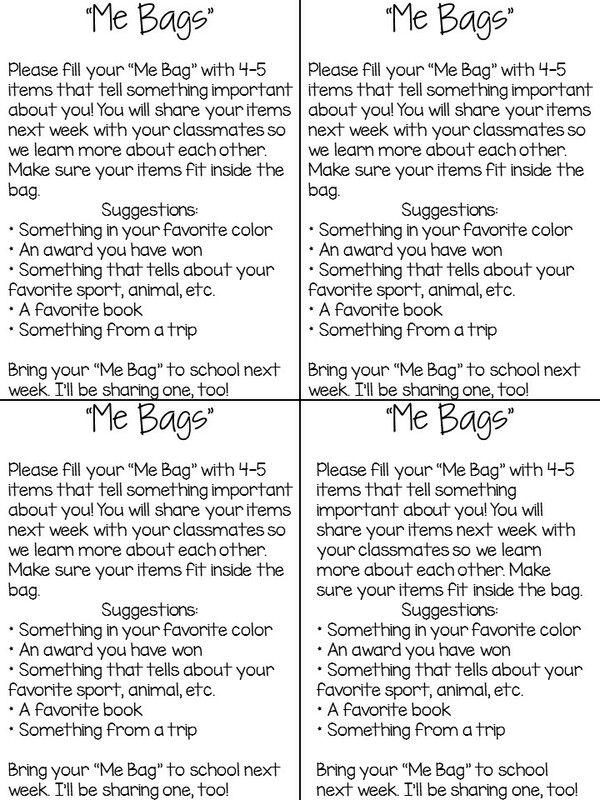 This is a getting to know you activity that I like to do at the beginning of the year. 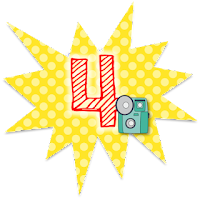 Each child brings in 4-5 items that represent themselves. 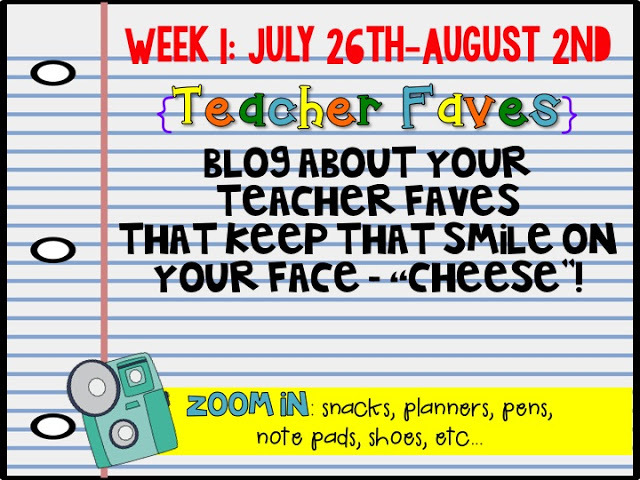 We all share throughout the first week of school.